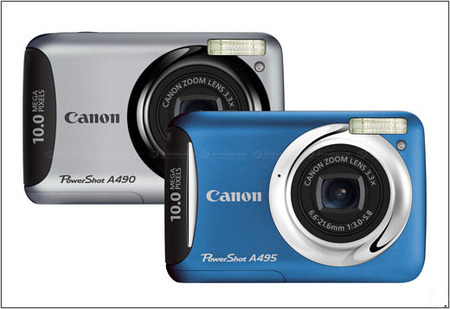 The CES offerings from camera-makers Canon include a duo of affordable and user-friendly digital cameras – the PowerShot A495 and the PowerShot A490, updates on the manufacturer’s budget ‘A’ range. Available in silver and red & blue (for the A495) these are cheap and cheerful cameras bringing some zingy features to the affordable price bracket. The new cameras offer a 10.0 Megapixel sensor and genuine Canon 3.3x optical zoom lens, producing large, detailed images. Smart Auto mode takes care of picture settings automatically, and pictures are framed and displayed on a bright 6.2cm (2.5″) LCD display. Face detection and on screen red-eye correction allow for better portrait photographs and for intelligent self-timer shots – the A490 and A495 recognise when your face is in front of it. And screen modes ‘Poster Effect’ – which reduces the number of colours for an older, poster-style look and ‘Super Vivid’ which adds a higher level of saturation to images to provide a dramatic, enriched effect, let you go a bit creative with the shots without the need for a computer. The cameras come with Smart Automatic features such as the Scene Detection Technology, which automatically recognises shooting conditions and applies the optimum picture settings required to get the perfect shot: whether that’s night-time, a close-up or a bright sunny day. Both available from February in Argos. No prices yet.